Cooler evenings are already upon us, and you might be considering the best way to keep your little one warm at night. After all, a warmer night’s sleep is a longer night’s sleep (hopefully). We have a lovely and cosy idea. You wouldn’t think it, but flannelette fitted sheets for cots can be ridiculously hard to come by. If you want them to look great and be good quality, the task becomes even harder. But we’ve found some that have it all, and if you’ve ever slid between cosy flannelette sheets on a cold evening, you’ll be glad to put them on your baby’s cot too. 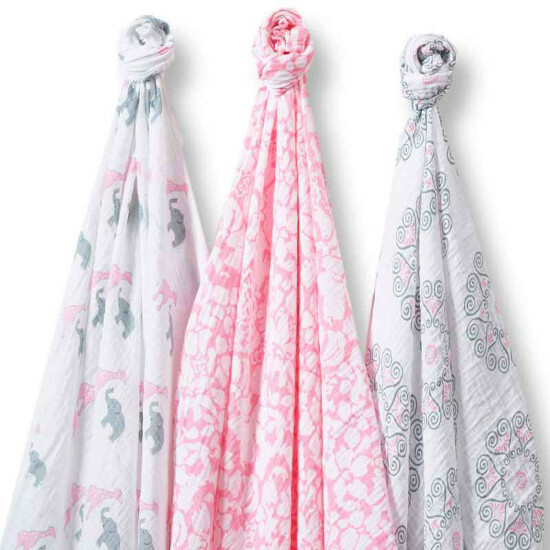 This lovely sheet with baby elephant print (at top) is one of the extensive flannelette range from Swaddle Designs. Their fitted sheet range for cots comes in more than forty designs and colours. Whether you’re looking for traditional baby animal style designs or something much more modern and geometric, you will find it here. Swaddle Designs also produce a similarly impressive range of muslin wraps – and no household with a baby can ever have too many of those. You can pick up a great selection of both the fitted sheets and the muslin wraps locally at The Baby Closet. Fitted sheets are $44.95 and wraps are $49.95 for a pack of three in coordinating colours and designs.